I love the raccoon tail! So mangy and troll-like! Look out, Gnome! I like it, makes me sad its not a book already. I want to see the rest of the pictures. I'm pretty sure that is one of my uncles. It just occurred to me that I should replace the gnome with a billy goat. The bridge troll's story had billy goats--not garden gnomes. May have to revise this one. Yes, a billy goat running in front of the tractor would be awesome! In honor of the new Gnomeo and Juliet movie? I like the gnome instead of a goat. But I'm sure you could make a goat just as funny. You're awesome. I did a take on Goodnight Moon (freaky book) in honor of our email digest discussions. I feel like either could work. The gnome is really cute and seems to fit the picture best. 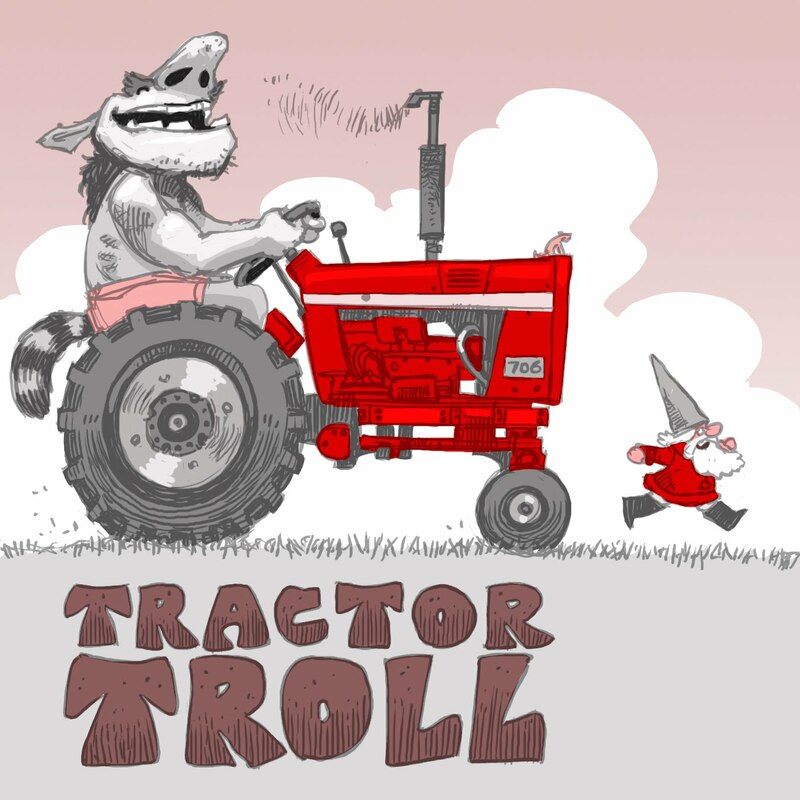 But it would also be fun to have the troll drive his tractor into the field that the billy goats gruff crossed the field to get to. I love this. If you get it published, I'll read it to my students when I teach the letter "T." Pinky swear. Seriously, I want it now. If you went the billy goat route, I could have the kids (pun intended) put on a 3 Billy Goats Gruff play and everything. Has someone been watching "David the Gnome?" Tractor Troll. HAHA! I'd totally buy that!